Good evening! Or good morning if you’re like me, and are staying awake at ungodly hours to watch this Australian Open final between Novak Djokovic and Andy Murray. It’s been a blast, but I won’t miss the insane sleep schedule I’ve been keeping. Also, having a social life will be nice. Fresh off an impressive win over World No. 2 Roger Federer in the semifinals, Murray will attempt to win back-to-back Slams. Djokovic, who demolished World No. 5 David Ferrer in the semifinals, will try to win his third consecutive Australian Open title. 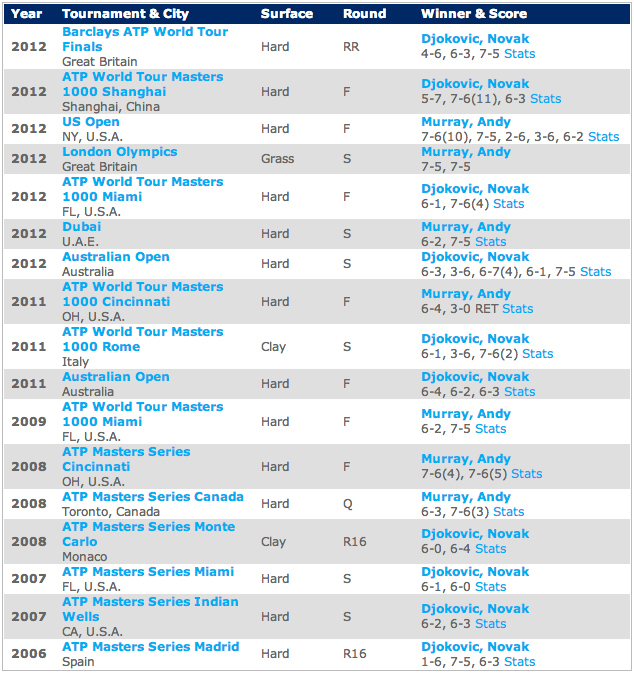 Djokovic leads their head-to-head 10-7, but Murray has had some recent success against the World No. 1, beating him on the way to his two biggest career titles, the 2012 US Open and the 2012 Olympics. 1. Murray’s forehand and serve have improved in the last 12 months, but they were more effective than ever in his semifinal match against Federer. A big determining factor for Murray will be whether he can sustain that against Djokovic, who is a much better returner than Federer. 2. Murray and Djokovic are both elite returners, and they will be doing their best to make things harder for the other on serve. Expect a lot of break chances, and whoever can capitalize the most will probably walk away with the trophy. 3. Both players are extremely fit, but Djokovic has had an extra day to recover, and he didn’t spend nearly as much time on court during his semifinal as Murray did. However, sometimes not playing a competitive match in a couple of days can hurt a player’s causes in a big match like this one. It’s hard to say what (if any) effect the respective players’ semifinals might have on this match. BREAKING: Have just alerted the ITF that the Yugoslav Djokovic is to be disqualified for non matching wristbands!! Awaiting reply!!! 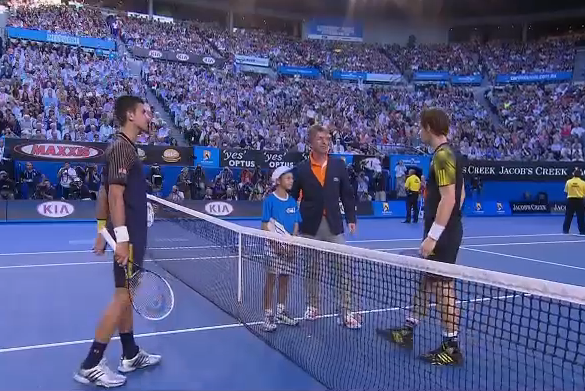 Murray wins the coin toss and elects to receive. I am never a fan of players deciding to receive. It makes no sense to me in almost any circumstance, unless you’re a low-level club player. 0-0: Murray wins the first point of the match in a longer rally, but Djokovic closes out the game at 15 with some strong serving, including his first ace of the match. Sometimes, Djokovic can be iffy in early service games, but he’s sharp so far. It’s cute how they’re dressed like twins. 1-0, Djokovic: Murray holds at love, Djokovic unable to get much going on Murray’s serve. 1-all: Murray fools around with his shoes after seeming to get a bit glued to the court on a point. Adidas shoes are having a brutal tournament so far. Djokovic holds with an ace. 2-1, Djokovic: Murray holds at love. They are both serving very well, but neither guy is doing much on the return. Just three return points have been won, all belonging to Murray. True story: that little brown mark on the back of Andrew’s robust right calf is a birth injury–a bruise from when he fell out of heaven. 2-all: Murray gets to 30-all on Djokovic’s serve. He hit a gorgeous slice down-the-line in that point. Djokovic plays a more aggressive point to get to game point, but he badly botches a swinging volley wide to get to deuce. Djokovic closes out the game with an insane running passing shot hit from the doubles alley. A high quality match, so far. 3-2, Djokovic: Djokovic earns two break points off a couple of loose Murray points, but Murray saves both with good composure. Djokovic comes in to finish off a long rally to earn a third opportunity. Murray is only making 35% of his first serves, but he saves the third break point. He pushes a cross court forehand long to give Djokovic a fourth break point. Murray saves it in another long rally. A Djokovic shot looks like it’s going long, but lands in, and Murray finds a great angle that forced an error from Djokovic. A nice, big first serve gives Murray a game point. An ace closes out the game. Four break points saved. This could be a huge hold. 3-all: Djokovic falls down mid-point, but wins it anyway. Those Adidas shoes are AWFUL. I don’t care how much a player is paid for an endorsement, I wouldn’t wear them. They’ve been quite the hazard. Djokovic closes out another service game. Murray hasn’t seen much in the way of chances on Djokovic’s serve so far. 4-3, Djokovic: Murray is getting slightly frustrated. He pushes a backhand long at 15-all and looks toward his box. A big serve gets him to 30-all. A long backhand-to-backhand rally is stopped by Djokovic, who thinks Murray’s shot was wide. He is correct, which gives him a break point. Murray drills a forehand and sets up a put-away to save the break point. Djokovic hits a backhand into the net, and Murray holds serve, coming into the net once again. Great, aggressive play from Murray. Djokovic may come to rue these missed opportunities. 4-all: Murray hits a horrid drop shot, but produces another dazzling backhand slice down-the-line. Still, Djokovic closes out the game. Murray will now serve to stay in the set. Point construction so far seems to be: squeak squeak aaaahhhhhh squeak squeak ooaahhkk aaahhhhh squeak squeak squeak aaahhhhh etc etc. 5-4, Djokovic: Murray holds at 15 with some incredible defense. Djokovic is making a few uncharacteristic errors, but I think many of them are a result of Murray’s strong play. So strange to see that none of the players attack the slow second serves. On the woman’s’tour, those 2nd serves would’ve been killed. 6-5, Djokovic: Djokovic finally punishes a Murray second serve, coming into the net to close out the point for 15-30. Danger zone for Murray, who is serving to stay in the set. Djokovic misses a routine backhand into the net. A huge miss, considering that winning the point would’ve given him two set points. Instead, 30-all. Another miss from Djokovic and a big Murray serve brings us to a tiebreak. Tiebreak: Djokovic starts out with a double fault. Murray bosses Djokovic around from the baseline for 2-0. Djokovic puts too much on a forehand, and Murray is up 3-0. Murray finds all the corners and another Djokovic rally shot goes long. 4-0. Djokovic finally gets on the board with a very nervy overhead. Another Djokovic error. Murray hits a huge forehand winner to bring up five set points. Djokovic saves the first with a lovely backhand down-the-line, but Djokovic makes yet another awful forehand error. Murray takes the set, 7-6(2). 0-0: Murray gets the hold, avoiding any early second set letdown. His defense is off the charts. Also, Djokovic is struggling. Djokovic’s body language is as bad as I’ve seen since early 2010. Murray holds at love. 1-0, Murray: Murray can do no wrong. Djokovic can’t seem to end a point right now. Every time he tries to pull the trigger, it ends in an error. Murray has three break points. Djokovic saves the first with some strong play, and Murray squanders the second with a silly error. Murray gets too defensive, and Djokovic comes forward successfully to save the third. Deuce. Djokovic hits an incredible forehand down-the-line to get to game point. The down-the-line giveth, and the down-the-line taketh away. Djokovic misses a backhand down-the-line very wide to bring the game back to deuce. Murray can’t get the return in play. Djokovic holds, but it wasn’t easy. Djokovic was about to roll over and die there, Murray turned him over, lifted him up and dusted him down. What has Kevin Spacey done lately let’s be honest. 1-all: Murray is suddenly back to playing more aggressively again. Djokovic cracks a great return winner, and Murray misses an inside-out backhand for 30-all. An ace gets Murray to game point, and an inside-in forehand ends the game. Murray holds. 2-1, Murray: What looked like an easy service game for Djokovic gets to deuce off a Murray return winner and a Djokovic forehand error. Murray lets him off the hook with a bad forehand into the net. Djokovic closes it out. 2-all: Murray holds again. The most notable part of the game consisted of Djokovic kicking a ball out of frustration. IT’S GOOD. 3 points to Djokovic. Still down a touchdown. Djokovic makes brilliant contact there.With his foot. @amyfetherolf Given how this match looks, punter is more accurate. 3-2, Murray: Despite his obvious frustration, Dokovic gets the easy hold. 3-all: Another easy hold for Murray. Did anyone expect this to be a servers’ battle? Zero breaks so far. 4-3, Murray: Murray absolutely smacks a forehand up-the-line for 0-15, then misses a forehand, and launches a tirade of self-hatred. Djokovic storms back with some great aggressive play, finishing off two points at the net to hold. 4-all: Murray doesn’t budge. He holds at 15. Murray just looks like he won’t be denied anything. World peace? Elimination of RedFoo in players box? 5-4, Murray: Djokovic gives a big fist pump after hitting a backhand down-the-line to get to 40-15. He’s starting to feel the pressure. He holds. 5-all: Another gritty hold for Murray. He’s a perfect 15/15 on his first serve points in this set. Djokovic berates himself during the changeover. Murray has gotten 81% of his returns in play. Phenomenal. Novak 74%. Not 2 bad either. 6-5, Murray: Djokovic holds his nerve at 30-all, setting up an easy put-away off a passive Murray return. He holds, and we’re onto a second set tiebreak. Tiebreak: Djokovic can’t get the return in play. 1-0, Murray. Djokovic comes up with a big serve down the T for 1-all. Murray misses a routine forehand. On serve at 2-1. Djokovic presses too hard, hitting another costly error. Murray chases a wayward floating feather between first and second serves. Apparently it distracts him, because he double faults. 3-2, Djokovic. The feather that tips the scale. Murray pushes a forehand down-the-line wide. It’s 4-2, Djokovic, at the changeover. A big serve brings him to 5-2. The finish line is in sight for the Serb. Murray forces an error for 3-5. Djokovic gets to 6-3 with a pressure backhand down-the-line. Three set points. Murray hits a horrid slice into the center of the net, and it’s level at one set all. 0-0: Djokovic hits a couple of aces to get an easy hold. Murray received treatment for a foot problem during the changeover, unclear whether it was blisters or something more serious. Something to watch. 1-0, Djokovic: Murray holds fairly easily. He seemingly wants to start clutching some body part, but he can’t decide which to choose. This match is like dinner at Red Lobster: nothing unexpected, average quality, takes forever for anything to happen. 1-all: Djokovic befuddles Murray on the return with a few good serves out wide. Another easy hold. Rinse and repeat. 2-1, Djokovic: Djokovic gesticulates and curses after an error. Murray makes a terrible face after winning a point. These guys make playing tennis look like so much fun! 2-all: Despite another shoe malfunction, Djokovic holds serve. 3-2, Djokovic: Murray holds at 30, and yells at himself. There have been 30 consecutive service holds in this match. Outrageous. 3-all: Another hold for Djokovic, surprise surprise. I think these guys are playing the score a bit. Weird thing about this holdfest: Neither guy is serving stupendous. Winning serve games with rallies, without tons of help from the serve. 4-3, Djokovic: Djokovic produces some great stuff to get to 0-30. Is it possible that a break is coming? Please? (I’m getting tired. It’s 6:30 a.m. here!) Djokovic gets to 0-40. Murray saves two break points with some composed play. Murray pulls the trigger on a forehand, but it strikes the top of the net, failing to drop over on Djokovic’s side. Djokovic gets the break! 5-3, Djokovic: Djokovic holds at love and takes the third set. 0-0: Immediate danger for Murray as Djokovic cracks a backhand down-the-line for 0-30. Murray drills a forehand to level it at 30-all. Djokovic lets Murray off the hook, despite a wimpy second serve. Murray holds. 1-0, Murray: Djokovic tries to do too much on an open-court forehand. It’s 0-30. Murray still looks dead. He misses badly on a forehand. Despite many grimaces, Murray earns a break point. He can’t get Djokovic’s serve in play. Djokovic is bailed out. 1-all: Murray looks like he’s in some sort of awful physical pain. Hard to tell what it is. And hard to take that at face value, because he often looks like that if struggling in a match. Djokovic, meanwhile, is looking fresher and fresher. Two break points. Murray saves the first with a nice serve down the T. Djokovic breaks on an overly aggressive netted backhand down-the-line from Murray. @australianopen His own, I trust. 2-1, Djokovic: Djokovic drops a couple of points on serve, but the hold was never really in doubt. Murray looks down and out. And scowl-y. 3-1, Djokovic: Murray hung in the game for awhile, but Djokovic breaks on a Murray double fault. This one is starting to look done and dusted. 4-1, Djokovic: Djokovic holds, in spite of a few loose points. He’s one game away now. 5-1, Djokovic: Murray holds, but it feels like a formality. Djokovic will serve for it. 5-2, Djokovic: Murray claws to 0-30, but Djokovic fends off the last bit of Murray’s hope, running him ragged around the baseline. Championship point. Murray meekly nets a backhand. Djokovic wins the Australian Open, 6-7(2) 7-6(3), 6-3, 6-2, in three hours and 40 minutes! The happy slam is over. Time to warm up for the snooty slam, the dirty slam and the trashy slam. What looked like a potential dramatic five set thriller fizzled out a bit after two tight sets. In the end, the things we knew could be liabilities for Murray (second serve) proved to be his downfall, but Djokovic, as usual, also produced some incredible tennis in Melbourne. These courts suit him very well, and I wouldn’t be surprised to see him win many more Australian Open titles in the future. I’ve never been a fan of the Murray vs. Djokovic match-up (I prefer Djokovic-Nadal, Federer-Murray, or Federer-Djokovic) because these two players can force each other into a kind of defensive lull. Today proved no different. Whereas Djokovic punished every short ball from Rafael Nadal in the 2011 US Open final, he sat back for most of the match and kept Murray’s shallow balls in play. It was enough to win the match, but not enough to produce classic tennis. I would’ve liked to see Murray stick to the more aggressive shot selection he employed against Federer. He wasn’t getting enough depth, and although he used down-the-line shots with some success, he could’ve used them more. They are virtually the only way to move Djokovic around the court enough to get him out of position enough to hit winners, and the variety/surprise value is key against an opponent like Djokovic who reads shot patterns so well. The result might be similar to 2011, but Murray’s progress can’t be denied. I think he’s in for a big year, and has a great chance at bagging another Slam, either at Wimbledon or the US Open. As for Djokovic, he’s off to a perfect start to the season. It will be interesting to see if he can rekindle some of his 2011 magic, or whether his 2013 will more closely resemble 2012. That’s a wrap! Thanks for following along. Now, for some sleep.